Free trial users who participate in sales demos tend to buy Appcues more often than those who do not. We’ve measured this over time, and because of this fact, we’ve tried a lot of different ways to get free trial users into demos. Before I go further, a disclosure for my fellow data nerds 🤓, whether getting on the phone is just a consequence of being interested, or if we are able to foster further interest by getting the phone is up for debate. We’ve never tested offering and giving demos against a control,but we’re pretty sure that a conversation about how to get the most out of our product results in a higher close rate. 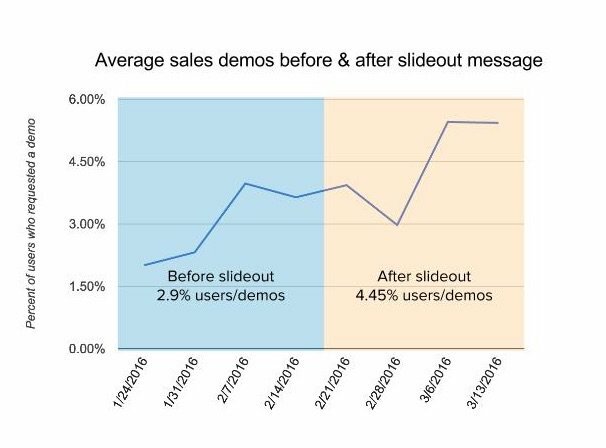 But no matter what kind of email we sent, it didn’t drive a significant increase in demo appointments created. Knowing the definition of insanity, we decided to try something new to inspire demos. We figured that if we put an in-app message targeted only to free trial users, they might at some point opt into a sales demo. We wanted the pattern to be non-invasive, and one that a user could opt into at any time without having to stop and close the message out. We therefore decided a slideout would be the perfect UI pattern for the job. Offering this option to get in touch right in the product ultimately drove a 50% lift in the volume of sales demos we perform every month. At Appcues, we love to build effective UI patterns to help you engage your users in-product. 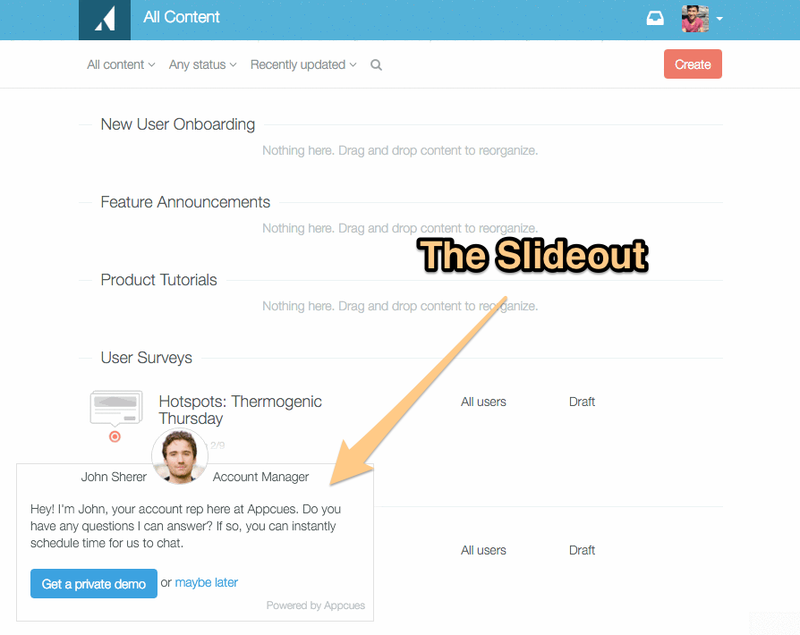 We had so much success with this demo slideout that we created a Slideout tool for you to do the same. There are plenty of other cool things you can do with Slideouts. Check out some additional use cases here and be sure to give the product a try.